Optical data transceivers are the appropriate choice for any application where data needs to be transmitted without cables and without interference. 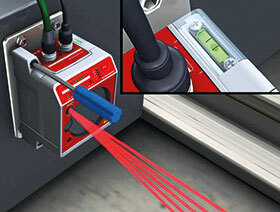 The Leuze DDLS 500 data transceiver makes contact-free optical communication a simple task. Especially suitable for applications where mechanical systems are pushed to their technical limitations, this robust optical data transceiver has a patented hand adjustment process making it quick and easy to achieve precise alignment of the data light beam. Data transmission of longer distances is just as simple as the unit has an integrated laser alignment aid. Four laser spots on the floor assist in the accurate alignment of the device. Equipped with Leuze’s availability control, the transceiver offers constant monitoring of the receiving level which means that in the event of an impending failure the user will be alerted. The Leuze DDLS 500 supports all common Ethernet protocols including Profinet, EtherNet IP, EtherCat, Ethernet TCP/IP and Ethernet UDP. The device offers real-time optical data transmission at 100 Mbit/s over a distance of up to 120 metres.